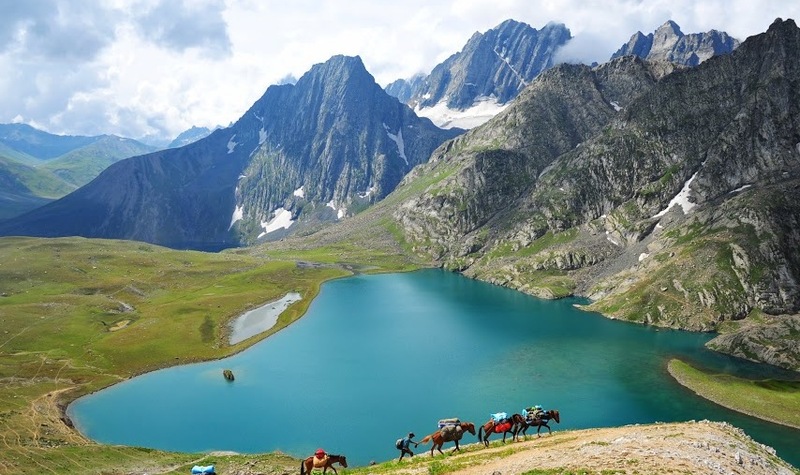 This trek encompasses some of the most beautiful and majestic lakes of Kashmir. There are many lakes that will come across our way accentuating the beauty of the trek. The trek will lead us through an ancient well trodden route which is been used by herdsmen and traders for centuries. Such as the beauty of this trek that once been on it you will like to do it more than once. We will come across beautiful and pristine lakes like Nundkol, Twin Lakes of Gangabal, Vishnasar, Kishnasar, Gadsar and Seven Lakes of Satsar. Beside sightseeing you can also do Trout Fishing in some of these majestic lakes. Apart from the lakes we will come across snow clad mountains, green meadows, rock terrains, sparkling streams, silver birches and untouched beauties of nature thus making it a complete trekking experience. Thick forest of maple trees and beautiful meadows of yellow wild flowers will make our day. Kashmir Great Lakes Trek will stay in your memories forever once you have been on it. You can reach Srinagar via flight or via bus or road through Jammu. The road passes along beautiful mountains, rivers and valleys as you come across the most beautiful place on earth. From Srinagar its a 3 hours drive to Sonamarg via thrilling serpentine roads. Sonamarg literally means a "meadow of gold". It's one of the important township and tourist place in Kashmir Valley. It's also the starting point of some of the popular treks. Surrounded by Great Himlayan Peaks and Glaciers like Kolhoi Glacier and Machoi Glacier and peaks above 5000 meters like Sirbal Peak, Kolhoi Peak, Amarnath Peak and Machoi Peak, Sonmarg at 2800 meters stays covered in snow for 4-6 months and remains inaccessible during that period. There is no permanent settlement in Sonmarg and inhabitants stay only seasonally here. The Zojila Pass likes 15 kilometers east of Sonmarg and being one of the highest pass for road transport , remains under tight control of Indian Army due to its strategic importance. The start of our trek marks the beginning of our adventure. As we start early at around 8am, after an hour distance we will come across the last eatery, we can have breakfast and replenish our supplies from here as we can collect provisions for our 7 days journey from here only. From here we descent to the bank of Sindh River and then quickly ascends towards a meadow. We can have great views of Sonmarg valley from here. This place is surrounded by Giant Maple and Pine trees. From we descend again towards a small stream with crystal clear water before climbing up again towards a trail surrounded by dense forest and soft velvet grass. The views will keep getting better and better as we progress through our trek until we reach the end of the forest over the top of a ridge and a gentle meadow on the other side with a downward slope. This is the campsite at Shekdur. We will stop here for rest and to click pictures as we sit amid magnificent views of the valley. We can see small river streams, beautiful meadows and dense forest along with the town of Sonamarg all along from this ridge. We climb down over the slope on almost flat meadows lined with Silver Birch Trees. On our right there will be snow clad mountain peaks. After rest we keep walking on the grassy meadows for a few hours till we reach the end of the meadows towards a valley on the right side of the river, here the trail will leads us to our camping site surrounded by trees, called Nichnai. We camp here tonight on an elevated ground. Today will be a long day day hence its best to start early for a headstart. We will be crossing Nichnai Pass today which is visible from our campsite. The route is filled with scenic beauty and the air has a freshness around it that gives us an energy boost. After an hour's walk we cross the river and then keep walking on its left bank for another hour. From here the trail will go steep as we traverse the meadows. On our way we come across a blue lake, where we will click some pictures and then further continue our climb to Nichnai Pass which will usually take an hour from here. We can view magnificent views of the entire Sonmarg Valley from here. The pass is wide and located in between huge mountains at 4100 meters. The descent from the pass is steep, uneven and rocky thus maybe a little painful initially but then it becomes comfortable as we reach lush green meadows and grasslands adorned with beautiful red wild flowers. There is a waterfall nearby falling from a cliff and beautiful views worth admiring. The terrain becomes softer and flatter from here easing on your feet on grassy meadows and the views of the Himlayas are astonishing. We reach the end of the valley to be greeted by a gurgling stream flowing on our left which eventually flows down to Vishansar Lake which is a distance of about half a kilometer from here. Vishansar is surrounded by 4 mountains and is located not very far from our camping site near the stream. Since the altitude would be higher at Vishnasar, we would be camping near the stream. We could spend the day enjoying magnificent views of the lake and enjoying the sun. We will enjoy fishing (subject to permission) and then in the evening come back near the stream to retire in our camps. Today will be a rest and acclimatization day as we stoll around and rest near the lake as well as ascent a little for acclimatization. Today is the day to enjoy the beautiful views and bask in beautiful Sunshine at the open meadows near the lake. We start early in the morning as we are heading for Gadsar Pass. In less than an hour we will reach Kishansar Lake situated at the base of Kishansar Peak. 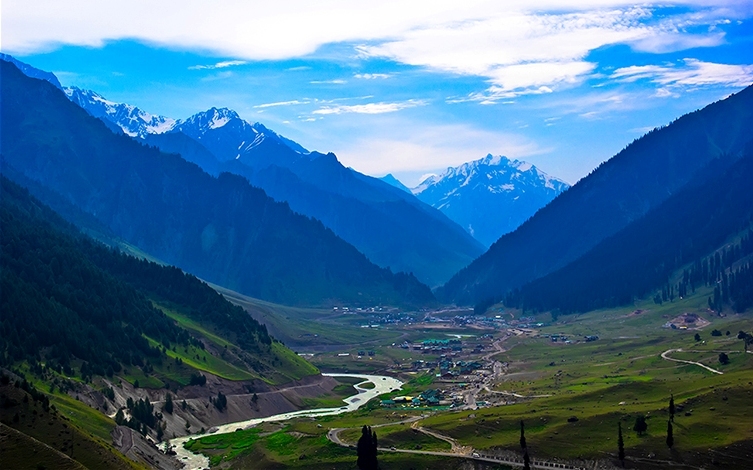 Like Vishanasar, Kishnasar is also a big blue lake surrounded by vast meadows. There are multiple trails here and fine views of the meadows and both Vishnasar and Kishansar Lake from an altitude. We can walk along difficult trails for fine views or choose the easier flatter trail over the meadows. As we continue on our trek we will come across many meadows and Himalayan scenery, however after a while our trek will narrow down to a lane leading to the top of the ridge which will take approximately 2 hours from here. From here, after a short traverse we will reach Gadsar Pass, which is situated at the edge of the ridge. From here the views atop are breath-taking as we can spot many small lakes from top of this pass. There are beautiful meadows with colorful flowers in the vicinity on our way towards descent. On top of the pass we can see some snow and magnificent blue flowers adding charm to its beauty. On our way down we will come across Yamsar Lake. As we continue our trail along colorful Iris flowers, we will reach Gadsar Lake. It's one of the famous and prettiest lake in the region covered with blue flower beds and overlooking snow clad mountain peaks. Abundance of blue flowers make Gadsar Valley look like a blue valley gently sloping down. Both Yamsar and Gadsar are connected through a stream. 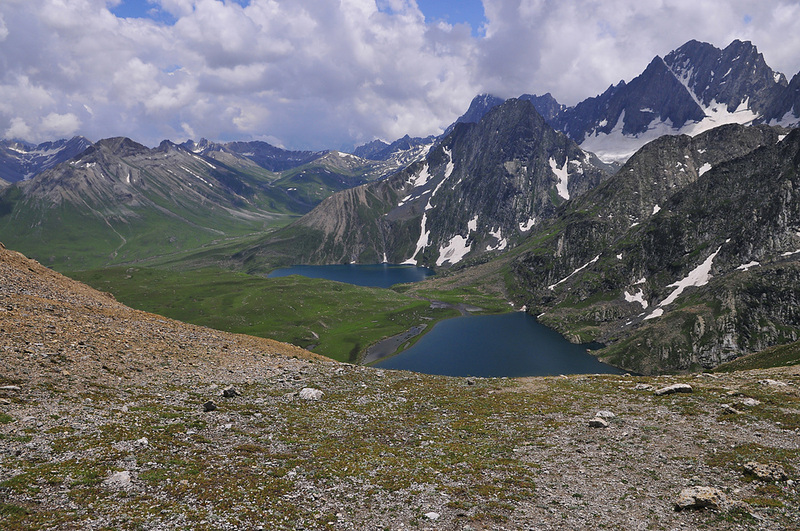 Gadsar pass is 13800 feet, and Gadsar Lake is 12,500 feet. After spending some time here and resting we will proceed on a downward trail towards Gadsar Army Camp. After some time the trail widens up and we come across another un-named blue lake on the left. The Snow Clad mountains will disappear now giving way to barren mountains as we lose altitude. After continuing our trail and crossing a shepherd settlement we reach the army camp. We report here with our ID cards as we need permission to move further from army headquarters which is a few hours distance from here. As the personnel at the army camp process our permission by checking our details, we will camp nearby. From the army camp we make a left towards the steam and further down the trail crosses the stream and heads up towards the mountain. We can cross the stream barefeet in icy cold water and proceed to the ascending trail as we reach the end of the tree line. After another half an hour the trail flattens out to a meadow with deep craters on our right. The landscape is captivating as on front there are lone mountains. We talk towards a ridge on our right through a flat green meadow along a stream. There is another army check post here which will stop us for ID checking and questioning. We can either camp here near the stream if later or else move ahead towards Satsar Lakes (a collection of seven lakes) which is 10 minutes down from here. We will camp near the big mountain lake along its green settings and beat the chilly winds with campfire. Today will be a long and tiring journey towards Gangabal as there are lot of switchbacks on our trail with path full of boulders. We start our journey by gradually walking towards the widest of Satsar Lakes. As we reach the biggest lake, which is also the last we will start our descent for half an hour over boulders towards the forest line. From there we will climb some ridges along a zig zag path and a rocky traverse. We will come across a small settlement of shepherds and keep climbing till we reach the last of the ridges situated at 13,500 feet. The views from here are breath-taking as we will be able to see the twin lakes Gangabal and Nundkol which is our destination. You can see the contrast of barren and green mountains standing beside each other. From here our steep descent begins over rocks so brace yourselves for the challenging stony descent. We will cross a stream and in another half an hour reach a meadow again and finally tree line a little ahead of it. After a short while from here we will reach Nundkol Lake which is a popular camping spot. The Harmukh peaks are visible from here with its glaciers spreading across the mountain towards the lake. A stream flows from Nundkol connecting Gangabal Lake which is another 30 minutes walk from here. After some pictures we will proceed towards Gangabal Lake which is also our resting site for the day. We cross the stream over a bridge to reach the banks of Gangabal. We will camp here tonight among the pristine beauty of the lake and give ourselves the well deserved rest. Today will be a very tiring trek over boulders and would take a heavy toll on your feet. We start from our camp towards the tree line along the stream. After 30 minutes on our trail we will reach a grassy campsite filled with yellow flowers. Few kilometres from here there will be a pine forest, which will continue along with us for 6-7 kilometers. We will cross some houses and settlements while walking along the forest. The path here is gentle with little ascends and descend but you won't be losing or gaining much altitude. We will also meet more trekkers heading toward Gangabal on our way. After a long level walk alongside the forest our steep descent begins. This last leg of rough terrain takes most of our endurance test as we lose 3000 feet altitude in 4 kilometres to the village of Naranag. Being at a lower altitude people stay all the year round here. After a short visit to Naranag Temple we will climb our jeeps and drive down to Srinagar to retire in our comfy hotel rooms.